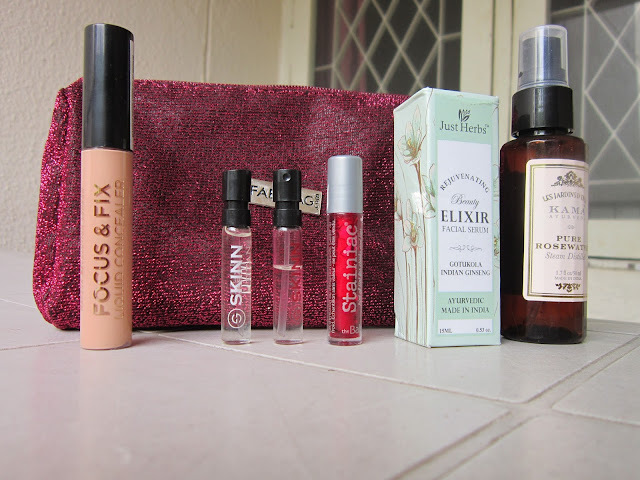 Today I'm here to share my views on the September 2015 Fab Bag :-) I was pleased to know that Fab Bag and I shared our birthday month & I was really looking fwd to receiving this month's bag. As usual it got slightly delayed & I wouldn't put out a review without using the products for sometime, so I apologize for the delay in this post going up. The 3rd Anniversary Fab Bag is deep magenta & shiny all over. The quality of the bag is really good & it's something I won't use to just STORE makeup in. It's so pretty, I would actually use it as a clutch for evenings out :-). Let's get into the product reviews now. 1. 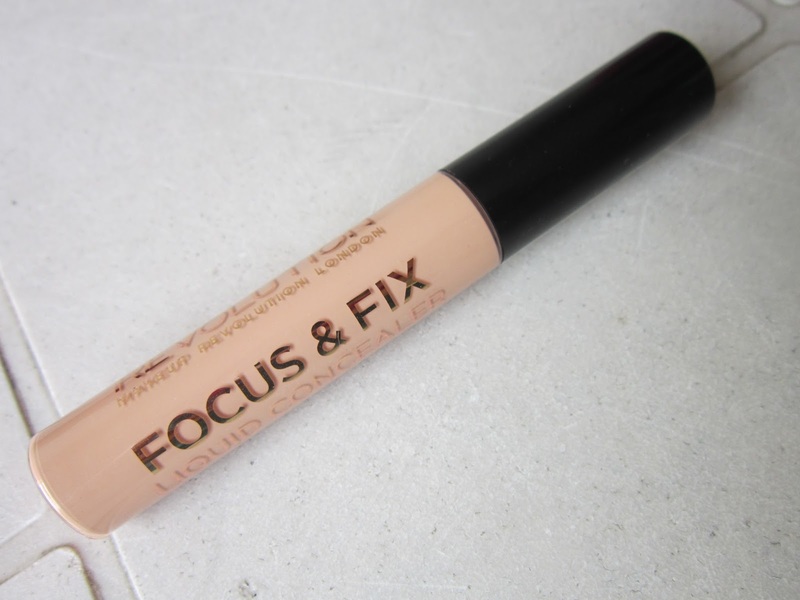 Makeup Revolution London 'Focus & Fix' Liquid Concealer - I'm on the fence about this one actually. It's sheer & I don't know if that is a good or bad thing. 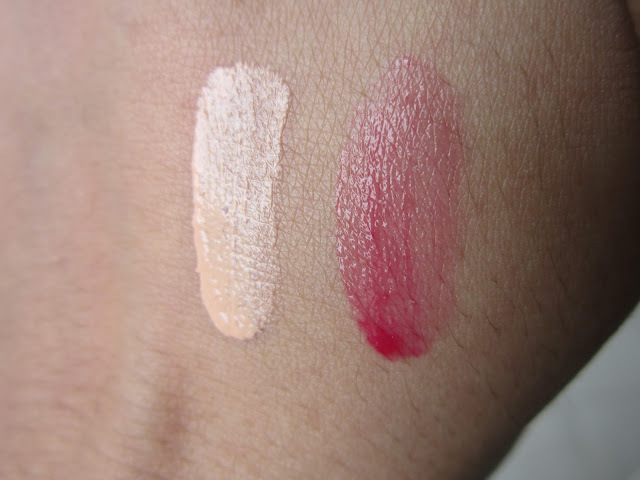 It's sheer & hence doesn't have full coverage; also it's sheer enough to be used on a daily basis. 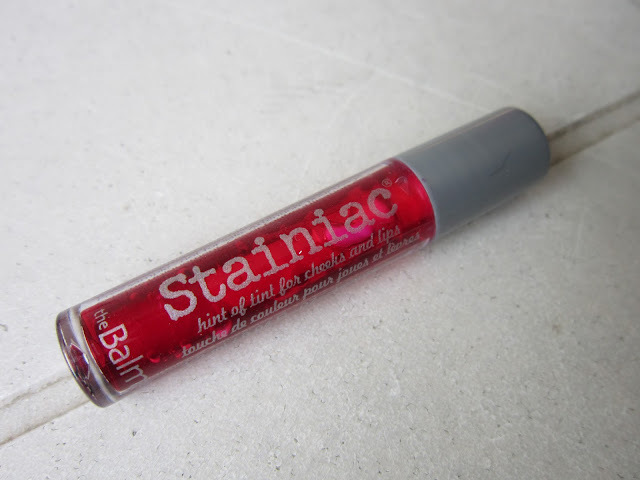 So I guess, I will stick to using it for daily wear like I have been. 3. 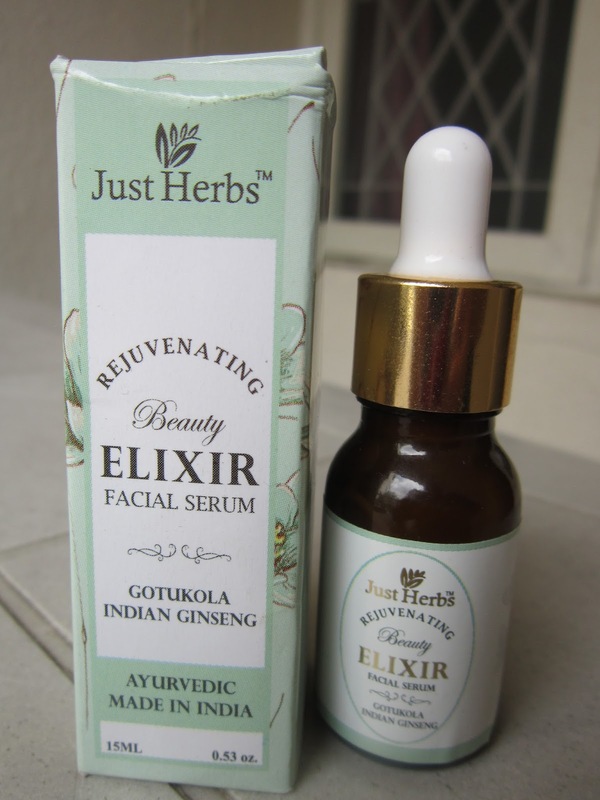 Just Herbs Gotukola Indian Gensing Rejuvenating Beauty Elixir Facial Serum - I'm not going to lie, this is my least fav of the whole gang :-( It's smells like someone made dough for bread & left it to ferment...lol sorry I didn't know how else to describe it. I'm also going to be honest and tell you that I have used this only once, in spite of the smell, only to review it ... but then that's it!! I couldn't get myself to use it again, thanks to the horrid scent. I'm picky like that... I ain't gonna put anything on my face that smells like that, no matter how nice & nutritious it is, for my skin. Sorry Fab Bag, this one gets a 'thumbs-down' from me!! 4. Kama Ayurveda Pure Rose Water - I have been absolutely loving this!! Easily my favourite product in the bag this time!! 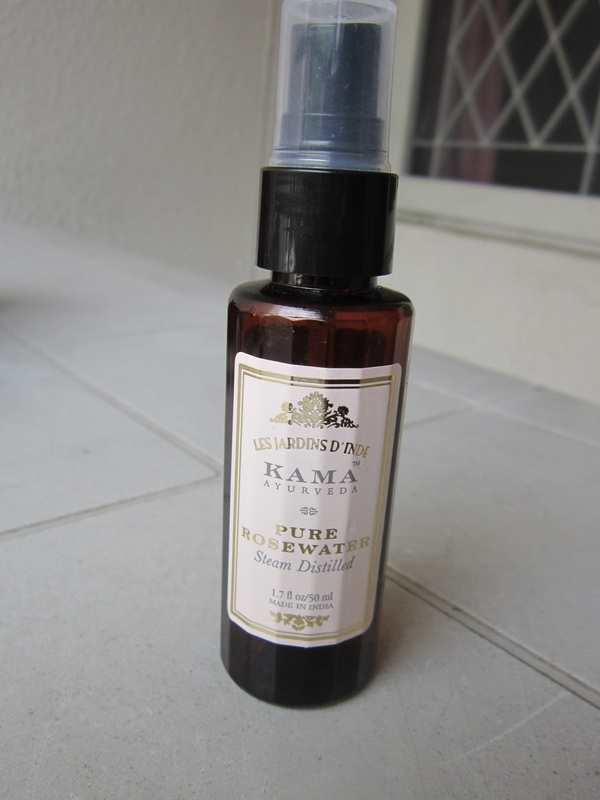 The steam distilled rose water comes in a spray bottle that I use numerous times during hot, humid days. I have also used this at times when I am taking a break from my kitchen duties; kitchens can get pretty hot, humid & suffocating at times, so when I come out to take a quick break, my lil BFF is ready to help me de-stress & calm me down. Let me also tell you, that thanks to this lovely product, I am not 'perpetually flushed' anymore. The rose water calms down the overall redness on my face and is a wonderful toner. I use it on my face, even after I step out of the shower. 5. 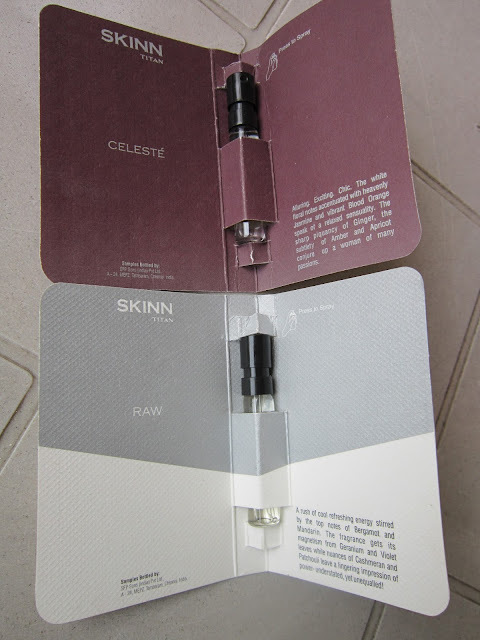 SKINN by TITAN : Celeste for Women & Raw for Men - I'm very bad at describing fragrances, so I'm not even going to try. However let me tell you something, I was pleasantly surprised to see not one, but TWO perfume samples in the bag this month!! That too FOR HIM & FOR HER (the Husband says Thanks!!) I actually happen to like both the fragrances & thanks to the samples, SKINN by TITAN will definitely be one of my top options, next time I'm in the market for perfumes. I got the same products in my Fab bag! I love the Just herbs Face serum and Kama Ayurveda Rose Water.